WASHINGTON - A top leader in the Haqqani network who played a central role in attacking coalition forces was killed Thursday in Pakistan, U.S. officials said. Janbaz Zadran was killed in the Haqqani stronghold of Miram Shah in North Waziristan, Pakistan. The area reportedly was targeted in a drone strike the same day he died. U.S. officials say Zadran's death makes him the most senior Haqqani leader in Pakistan to be taken off the battlefield. The officials said Zadran helped the Haqqani network orchestrate attacks on troops in Kabul and southeastern Afghanistan. The officials spoke on condition of anonymity to discuss intelligence matters. Zadran had access to Haqqani's leadership in Miram Shah. He served as a key lieutenant to Haqqani network commander Badruddin Haqqani. In May, the U.S. designated Badruddin Haqqani a terrorist. He's the son of the group's founder, Jalaluddin Haqqani, according to the State Department. U.S. intelligence considers the Haqqani network the No. 1 threat in Afghanistan and that it is supported by Pakistani security forces. The strike came as U.S. special envoy to Afghanistan and Pakistan Marc Grossman arrived in Pakistan to improve ties between Washington and Islamabad that have been severely strained by stepped-up American claims of Pakistan assistance to the Haqqanis. The missiles hit close to Dande Darpa Khel village, which is home to a large seminary with links to the Haqqanis. Later Thursday, another pair of drone-fired missiles hit a militant position on hills close to the frontier in South Waziristan, killing six people, intelligence officials said. They said the militants were firing rockets and mortars across the border at an American base in Machadad Kot. 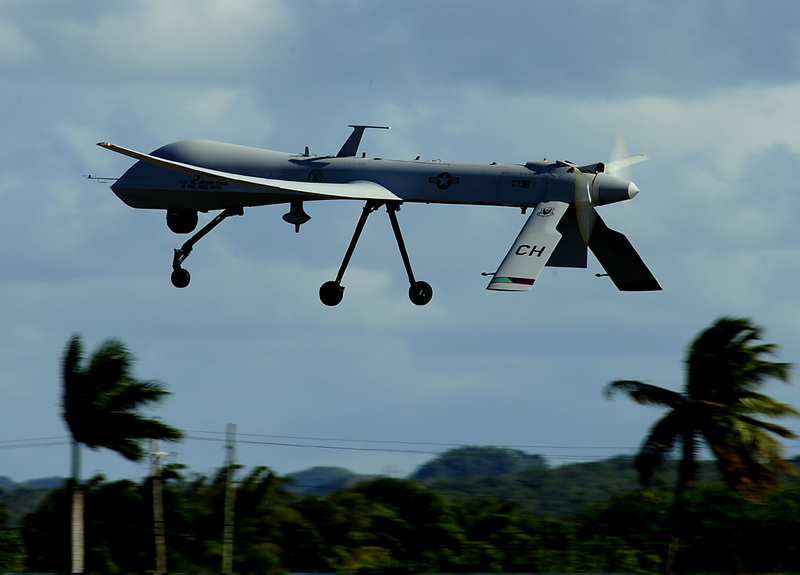 U.S. officials do not talk about the CIA-led drone program. NATO and U.S. officers in Afghanistan were not immediately available for comment. The al Qaeda-allied Haqqani network is one of most organized insurgent factions fighting the U.S. presence in Afghanistan, and it has been blamed for high-profile assaults against Western and Afghan targets in the Afghan capital, Kabul. Washington has long urged Islamabad to attack the fighters, who live undisturbed in North Waziristan despite the region being home to several thousand Pakistani troops. At the same time, the U.S. is pursuing the possibility of peace talks with the Haqqanis and other Taliban factions, reflecting the fact that the insurgency can't be defeated militarily. In brief remarks to reporters, Grossman, whose mission is to promote the peace process, talked about his confidence that the U.S. and Pakistan can "can make a commitment to future work" together, suggesting work still needs to be done to restore the relationship. Last month, senior American officials accused Pakistan's spy agency of assisting the Haqqani network in attacks on Western targets in Afghanistan, including a strike last month on the U.S. Embassy in Kabul. Pakistani officials have denied the charges. They were the most serious allegations yet of Pakistani duplicity in the 10-year war in Afghanistan and sent already strained ties between Islamabad and Washington plunging further. Obama administration officials have since backtracked somewhat on the claims. Most independent analysts say Pakistan is either tolerating or supporting the Haqqani network to some degree because it foresees chaos in Afghanistan once America withdraws, and wants to cultivate the group as an ally there against the influence of India, its regional enemy. Since 2008, the United States has regularly unleashed unmanned drone-fired missiles against militants in the border region, which is home to Pakistani militants, Afghan factions like the Haqqanis and al Qaeda operatives from around the world, especially the Middle East. This year, there have been around 50 drone strikes, most of them in North Waziristan. Pakistani officials protest the strikes, which are unpopular among many Pakistanis, but the country is believed to support them privately and makes no diplomatic or military efforts to stop them. U.S. leverage against Pakistan to get it to fight the Haqqani group is limited because it relies on the country to truck much of its war supplies into Afghanistan. The supplies of non-lethal material arrive in Pakistan's port of Karachi by sea before traveling into Afghanistan by land. The convoys are occasionally attacked by insurgents, especially close to the border, where the militants are strongest. On Thursday, gunmen opened fire and set ablaze five tankers carrying oil for NATO and U.S. troops in Sindh province, some 1,200 miles from the border, said police officer Khair Mohammad Samejho. The tankers were parked outside a restaurant in Shikarpur district when they were attacked, he said.